Did you know that according to the Canadian Mental Health Association, 12% of all Canadians suffer from some form of anxiety disorder? We can all feel nervous and worried at times. Anxiety can help warn us of danger or motivate us towards change. However, sometimes these feelings can become unmanageable, cause excessive distress, and interfere with our work, education, relationships, and feelings about ourselves. When it feels like our normal anxiety has become out of control, we may be suffering from an anxiety disorder. It is important to understand the signs and symptoms of anxiety so we can get proper treatment and learn to manage how we feel. Anxiety is a feeling of worry, unease, nervousness or panic that can occur about an event, an uncertainty, or for no identifiable reason. An anxiety disorder occurs when our symptoms interfere with our daily life functioning, our well- being, and are difficult to control. 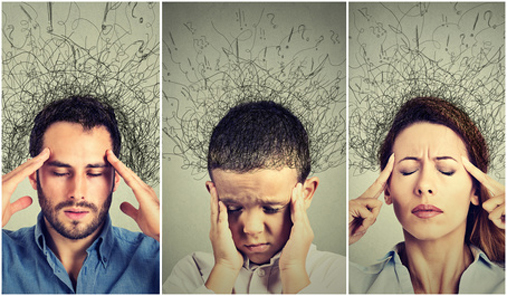 Each anxiety disorder has its own set of symptoms that impact our thoughts, feelings, and behaviors. The following is a list of anxiety disorders with a brief definition of each one. Generalized Anxiety Disorder – Excessive and unrealistic worry and/or tension that is difficult to control. Panic Disorder – Panic Attacks and feelings of terror that occur suddenly and repeatedly with no warning. Panic Attack – The sudden experience of “panic” including but not limited to sweating, chest pain, heart palpitation, racing heart, feeling of choking and hard to breath, dizziness, feeling like having a heart attack, feeling like going crazy or loss of control, and sense of impending doom. Obsessive-Compulsive Disorder – Repetitive and ritualistic thoughts and/or behaviors. Obsessions are recurrent and persistent thoughts, urges and images. Compulsions are repetitive behaviors (eg: hand washing, ordering, counting, checking) that one feels driven to perform in response to an obsession. Phobias – A persistent fear of an object or situation. Social Anxiety Disorder – Excessive and unreasonable fear of social situations. Afraid to make mistakes, look bad, be embarrassed or humiliated in front of others. Separation anxiety disorder – Anxiety in young children about separation or the idea of separation from their parent or caregiver. Post-Traumatic Stress Disorder – Exposure to a trauma involving death, the threat of death, serious injury or violence that causes intrusive symptoms like re-experiencing traumatic event, nightmares, flashbacks, or thoughts of the event. There are many different types of treatments to help alleviate the symptoms of anxiety and treat anxiety disorders. Seeking help from a Psychologist can help determine the most appropriate type of treatment for you. In therapy, a Psychologist will help assess your symptoms, diagnose any underlying anxiety disorder, and recommend a comprehensive treatment plan that targets the cognitive, behavioral, emotional, and social impact of anxiety on your life. A bio-psycho-social approach. Commonly used and well researched treatment methods include Cognitive Behavioral Therapy (CBT), Dialectical Behavior Therapy (DBT), relaxation training, meditation and mindfulness, stress management and behavioral activation. The purpose of treatment can be to help you identify your anxiety symptoms, understand the underlying causes of your anxiety, learn a variety of strategies and tools to manage your symptoms, and overall improve your wellbeing and life satisfaction. It’s important to get help right away before anxiety completely takes over your life. There’s no reason to suffer from anxiety when there is so much help available out there. If you suffer from anxiety, be sure to seek help today.